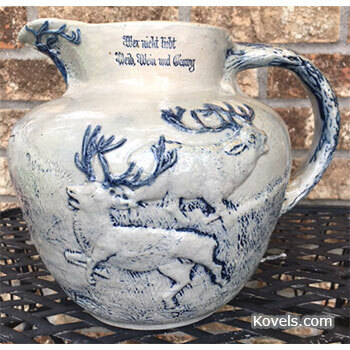 Q: Can you tell me who made this German pitcher and the possible value? It has raised pictures of deer and hunters. On one side there is a quote from Martin Luther, “Wer nicht liebt Wein, Weib und Gesang,” which is German for “He who loves not wine, woman and song.” I can’t read the wording on the other side. There is a blue stag’s head under the spout. There isn’t a mark on the bottom.